Stephen Behr had the kind of credentials needed to get a jump start on a PGA Tour career after finishing at Clemson. Instead the 2016 Byron Nelson Award winner decided to use his education to pursue a business career and keep his amateur standing. The 2016 Byron Nelson Award winner has many of the same goals as the golfers he played against in college who have turned pro. He just wanted to achieve those goals in a different way. Behr suggested his idea of how he could play in major golf tournaments in an interview on Amateurgolf.com. “Even in college, people always said, ‘You don’t plan on going professional?’” Behr remembers. “I was like, ‘No, I’m going to win the Mid-Am and play the Masters.’ So I’ve had this vision for a while,” he told the website. 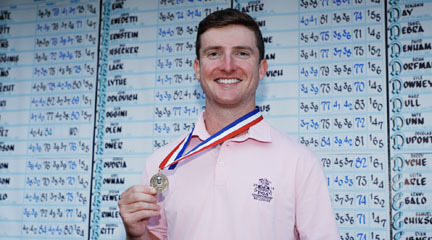 Behr took the first step towards earning a trip to the Masters by winning medalist honors at the USGA Mid-Am being played at the Charlotte Country Club. The former Clemson All-American was the only golfer in the field to shoot two rounds under 70. Behr claimed the top seed in the match play tournament by two strokes with rounds of 69 and 68 for a 137 total . Behr squeaked into the championship, he just turned 25 in April and is one of the youngest golfers in the field. “This is a really great start to my mid-amateur career,” said Behr. “At the same time, I know that I would rather finish 64th and win than medal and lose in the first round,” he said. Behr started the day in fifth place and didn’t do himself any favor with a double bogey on his first hole. “Pretty nervous start, it was almost a good thing because it made me settle my nerves a little bit. From there, I tried to pick good targets. My dad and I did a really good job of picking shots and clubs that would avoid getting out of position. I did that and played smart all day,” he said. 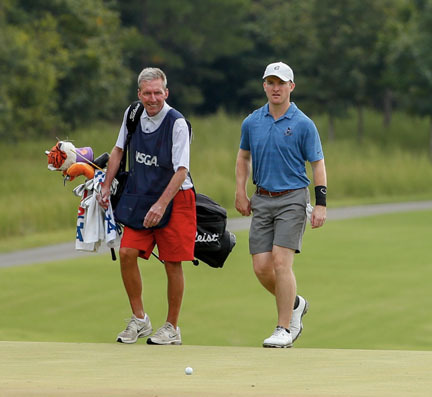 Behr’s dad, longtime Florence Country Club professional Steve Behr caddied for his son and helped him shoot the lowest score at the Carolina Golf Club, the second course used for qualifying. Behr will not know his opponent until the ties for the final spot in the round of 64 are broken on Monday morning. The former All-ACC golfer will play the last player to make match play, but he knows every match can be difficult. “I know anyone that makes match play is good enough to win a match against me. So I just need to focus on playing solid tomorrow (Monday) and get ready mentally for a tough match.,” he said. Also advancing to the round of 64 was Thomas Todd, III from Laurens. Todd shot a 36 hole total of 146 to tie for 42nd place. He will play Broc Haymon from Pearland, Texas in his round of 64 match. Haymon finished in a tie for 19th place. Three Greenville golfers have advanced to the round of 64 at the US Women’s Mid Am being payed in St Louis at the Norwood Hills Country Club. Woodard shot rounds of 77 and 73 for a 150 total and a tie for 10th place. Emily Rapp and Lea Venable finished in a tie for 46th place at 14 over par. Woodard will play Ana Alicia Malagon of Mexico in her first round match. Rapp will face Tara Toy Connelly and Venable will match up with Megan Buck in her round of 64 match.